Preheat the oven to 400° F. Place one pecan in each of the cups of two mini muffin tins. In a medium bowl, stir together brown sugar and cinnamon. Set that aside. Whisk the flour, baking powder, and salt together in a large bowl. Stir in the cream and mix until just combined. The dough will be soft and moist. On a lightly floured counter top, roll out the dough using a rolling pin dusted with flour as best you can until you have a rectangle that’s roughly 12″x7″. Smear softened butter all over the surface of the dough. Sprinkle the brown sugar-cinnamon mixture evenly over the butter. Starting at one end (one of the 7″ sides), roll the dough up into a tight spiral. Now use a sharp knife to cut the roll into 24 small spirals. Place the rolled bites cut side up into an 8″ or 9″ greased baking pan or place one cinnamon bun into each of the cups of a greased mini muffin tin. Bake for about 12-15 minutes, until they turn a faint golden. Turn the bites out onto a wire rack to cool completely. These bitty buns are almost unbearably delicious. They’re flavor is reminiscent of classic cinnamon buns. The cream biscuit dough is flaky, oh-so-tender, and buttered. 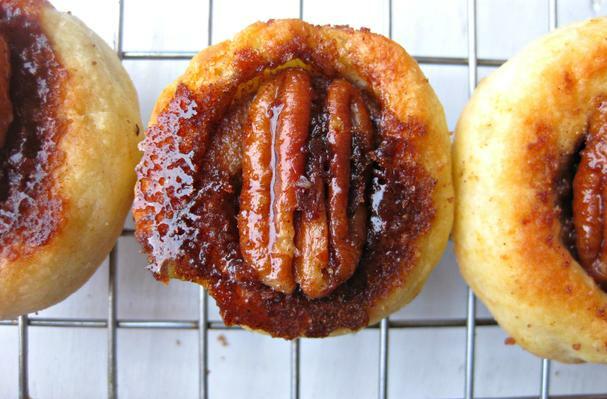 The inner swirl is warmly spiced with cinnamon and gooey with caramelized brown sugar. These are best when eaten the day they are baked.